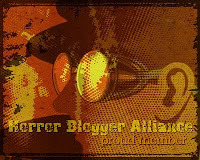 Midsummer Nightmares is an independent horror Concept Media (the people behind the not bad The Sleeping Soul). It is a teen slasher film that tries its best to emulate the stale genre. Audrey and her friends have planned a summertime Halloween party; a tradition they do every year. Unfortunatly for her there is a killer on the loose who has chosen the party as the place to murder everyone it wants to. Most the film is the run up to the party with various friends talking about nothing in particular, the last fifteen minutes take place at the party itself. Not a lot to it but then there never is with teen slashers. There is a heck of a lot of talking in Midsummer Nightmares, in fact for the first forty five minutes there is nothing but awkward, stilted conversations between characters that sound extremely unnatural. There are also a few murder scenes but each one doesn't last more than a minute or so. The sequence at the party features a huge body count but is quite silly really. The characters are nearly all unlikeable, squabbling and fighting amongst themselves, none of them seem able to act either which I guess is more forgivable for an independent film, a lot of over acting but the bad script also must take some of the blame. Alfred Hitchcock once said that having characters in danger but not knowing it created a lot of suspense for the viewer watching but here that doesn't work. The killer is so disjointed from the rest of the film that no one ever has an idea that people are being killed. Audrey gets a phone call from a friend who is in the process of being hunted down and killed but apart from a couple of arguments with her friends over if the girl was actually pretending or really in danger she doesn't seem to care enough to actually check up on her. The horror seems to take a side line to the boring friends party planning. Wearing all black and wearing a white mask the psycho still manages to not be scary at all, not once did I feel even a little bit of horror or fear. It doesn't help that everyone is murdered so quickly, one ridiculous scene had the killer almost springing from victim to victim as they entered a room one by one and got picked off. The reveal at the conclusion is no big surprise, certainly not original at all though kudos to the actor in hamming it up. 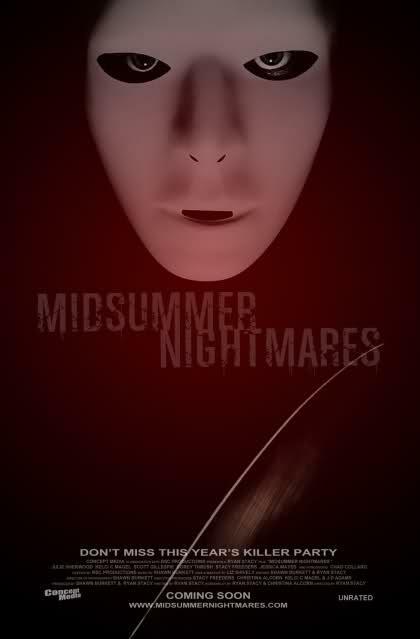 The real problem with Midsummer Nightmares is that it just emulates, nothing new is brought to the genre, there are far better examples out there it just feels a bit pointless to be honest, even the death scenes are nothing special as everyone is taken out in pretty much the same way. It feels like a lot of the conversations people have are not due to bad editing but more that it had to be left in to have the film still be feature length, cut out all the flab and the film would be around forty minutes which would have actually helped it I feel as there are some bits in here that are not too bad. The camera work is nice, it all looks crisp and clean with some nice locations used and the opening credits are quite fantastic, loved watching the character introductions. The special effects also really are not that bad, certainly seen far, far worse on films with much larger budgets. A lot of work has obviously gone into this film the best was done with what was had. Overall it is sadly hard to recommend Midsummer Nightmares, it does show promise in places but does nothing that really demanded my attention. Wish all the best for the sequel that I believe is currently in the works.